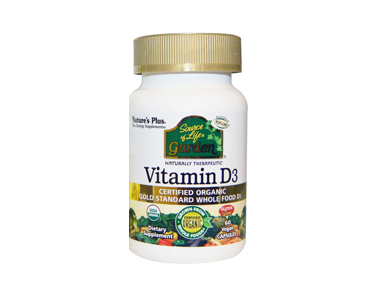 Order Natures Plus Vegan Vitamin D3 5000iu from the Online Health Food Store UK. Buy Natures Plus Vegan Vitamin D3 125ug 5000iu - 60 vegan capsules and other quality Vitamins A - Z safely online in the UK. This vegan vitamin D is derived from eight different mushrooms. In a wholefood base with natural whole food enzymes. Source of Life Garden Vitamin D3 caps with certified organic nutrients is the first supplement to provide 125ug per serving of cholecalciferol from an exciting variety of organic mushrooms. As official Natures Plus stockist in the UK, we sell quality Vitamins A - Z to customers throughout the UK in England, Wales, Scotland and Northern-Ireland. Where to buy Natures Plus Vegan Vitamin D3 5000iu safely online? Shop at the Online Health Food Store if you are wondering where you can buy Natures Plus Vegan Vitamin D3 125ug 5000iu - 60 vegan capsules safely online in the United Kingdom. Our Health Shop is located in the UK and our award-winning independent has been serving customers in England, Wales, Scotland and Northern-Ireland since 1976. You can buy our Natural Vitamins and Nutritional Supplements and other quality Vitamins A - Z online and we post out orders to any UK address. Vegan Vitamin D3 5000iu - Natures Plus Vegan Vitamin D3 125ug 5000iu - 60 vegan capsules in Vitamins A - Z and Vitamins and Minerals.